Hikers who are on the trail for more than a few days always obsess about the gear they will carry, their itinerary, and getting precisely the right wilderness permit. Then they toss in whatever camp food is on sale at their favorite outdoors store without much thought at all. Big mistake. A good food strategy will accomplish two crucially important objectives: it will keep the body fueled and it will provide a moral-boost several times a day. 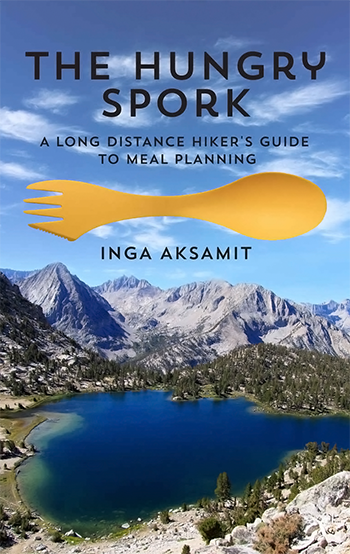 Ms. Aksamit’s new book, The Hungry Spork, is the absolute best way to achieve both of those objectives. The book is divided into fourteen chapters, but after reading it I think of it more as three sections with an addendum. The first section (chapters 1-4) lays out the different approaches you might take (commercially prepared food, “one-pot” meals you prepare at home, or ingredients to combine on the trail), what sort of challenges you will face when carrying or cooking food on the trail, how to make sure your food has enough “fuel” (i.e., calories) to sustain you, and a sure-fire, step-by-step plan to put it all together. The second section (chapters 5-9) gives you tons of great ideas regarding breakfast, lunch, dinner, snacks, and drinks. And here is a terrific idea: there are different sections for those hikers who are trying to hike with the lightest pack-weight possible (and thus need to worry about calorie density in the food), and those who are not. The third section (chapters 10-13) contains many tasty recipes, including – and I have to say I consider this one of the cleverest ideas I’ve come across – an idea for a special dessert in case anyone in your party is celebrating a special day while on the trail. The “addendum” (chapter 14) discusses how to get your re-supply packages where they need to be on time and in good condition. Although it is pretty clear that Ms. Aksamit is technically more-than-qualified to write on this subject, the text is clearly written, often funny, and anything but inaccessible for the average reader. Don’t think of it as an unappetizing energy bar of information; it’s more like a rich, creamy pasta dish – easily devoured and absorbed. Ms. Aksamit has done a real service to the hiking community by writing this book. If you are contemplating a longish hike, I’d consider it essential reading. thanks will be ordering my copy soon.